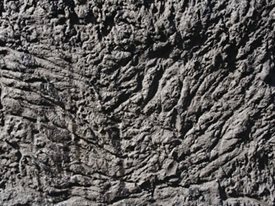 Watch an overview about RockMolds Lava Rock concrete stamp products. Aloha, and welcome to Hawaii! This is the feeling you get when you see concrete stamped with RockMolds.com's lava pattern. The Hawaiian Islands are covered with lava, creating a very unique landscape; however, lava has a mind of its own, flowing wherever it pleases. David Schwartz of RockMolds.com has figured out a way to recreate the look of lava using concrete stamping. RockMolds.com produces authentic lava rock stamps molded from the slopes of Haleakala on Maui. Schwartz's company has perfected the lava rock look using their original stamps and the perfect mix of color. 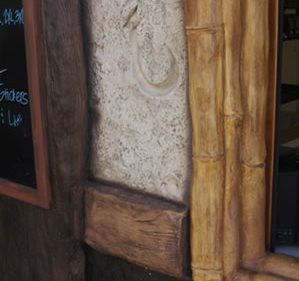 Although recreating lava is their specialty, RockMolds.com does a great deal of decorative concrete work, including vertical applications for which they use the FossilCrete system. The talent of the RockMolds.com crew can be seen in many of their projects. 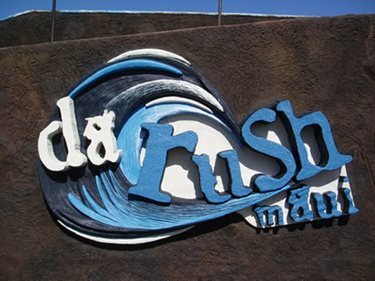 One recent project was Da Rush Maui. 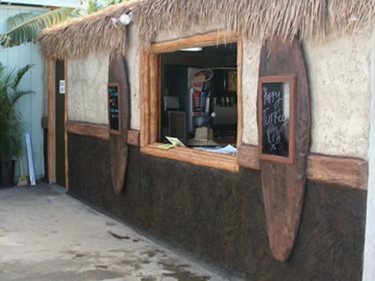 Schwartz describes this project as being incredibly fun because they got to use many different decorative concrete techniques, while still keeping a traditional Hawaiian feel. Throughout Da Rush, RockMolds.com created lava, white coral, and surfboards, all out of concrete. Native Hawaiian plants were also incorporated into the design, including tropical types of wood and bamboo. 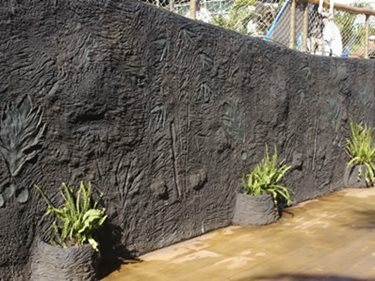 Vertically stamped concrete wall with lava pattern and native Hawaiian plants. Da Rush sign complete with lava texturing. Schwartz and his crew used concrete to create the lava pattern on the walls of the wave rider. FossilCrete vertical stamping mix with a dark brown integral color was used. Then lava stamps, along with custom native Hawaiian plant stamps, added texture to the walls. To complete the look, acid stain from Brickform was used to create the lava like color without any shine. The colors used were ebony and mahogany. Schwartz says that "the most challenging part of recreating lava with concrete is coloring the recessions and depressions. We have found out that integral color is so important for lava, it's nearly impossible to spray acid on a vertical surface and catch all these aggressive textures." However, Schwartz and his crew have had a lot of experience with the lava pattern and are very confident in their work. Store front with white coral on the upper half and lava texturing on the bottom. A very convincing concrete recreation of bamboo lines this window. Another challenge was creating the Da Rush sign, pictured above. The image started off very small, in fact it came off of a business card. Enlarging it proved to be a lot of work, but in the end it came out wonderfully. Schwartz explains the complicated process by saying that "the image was taken off the business card in a foam shop in CA, reproduced in 3-D form, sent over, attached to the wall with Fossilcrete, sprayed with Fossilcrete out of a hopper sprayer, hand textured to produce the water/wave effect, and hand painted all with Nature's Palete." An up-close look at the lava texturing done with RockMolds.com's custom stamps. 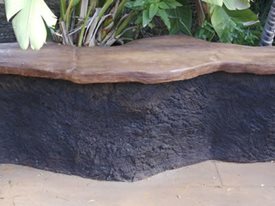 Throughout Da Rush, RockMolds.com also created benches and decorative accents that mimic weathered wood, bamboo, and coral. FossilCrete stamps and their line of stains, Nature's Palette, were used for these portions of the project. Schwartz said that "the Nature's Palette was perfect for the bamboo because it created a natural sheen that was very realistic." Schwartz also said that "the wood and the bamboo were one of the most exciting parts of the project because they turned out so well...we even had people coming up and knocking on the wood to see if it was real!" The seat of this bench was made with the weathered wood stamp from FossilCrete and their Nature's Palette stains. David Schwartz's career in the decorative concrete industry really took off a few years back when he attended the World of Concrete. That is where he met Greg Price, of FossilCrete, who helped him learn a lot about vertical concrete. Ever since, RockMolds.com has used many of the FossilCrete products, and David Schwartz has become the FossilCrete representative for Hawaii and Guam. The two companies have also worked closely together to create demos at the World of Concrete. Schwartz also said that this year's demo at the World of Concrete is not to be missed; it will be a lava surfer on which you can see RockMolds.com's lava pattern at its best.